Of course, as soon as I post about getting back to beer blogging, I get a ton of work dumped on me. Ugh…an article on various forms of beer haze will have to wait, but homebrewing can’t. No fermentation makes me a sad panda, so I knocked out a ménage à trois of Saisons this weekend. The first fermenter is a yeast/brett blend that’s getting kegged on copious amounts of dry hops for what should be a funky/hop fruity kick when it’s done. The small one in the middle is a half gallon of an experimental beta White Labs saison/brett blend, which only doles out 15 billion cells (i.e. barely enough for a half gallon of low gravity wort). It’s not a good idea to yeast start brett blends, so I’ll have to live with the 5-6 bottles I get. The aroma out of the bubbler is already tantalizing. The last is also yeast/brett fermented, but going to get a cheaty sour treatment. It’s cheaty due to the half ounce of 88% lactic acid I’m going to add during the back end of fermentation. The base beer is 80 IBU, far higher than a souring bacteria can handle, so traditional methods are out. This will at least give me an idea if I can adapt this recipe or blend in a separate soured wort with any kind of positive results. These should be ready to taste test in a couple months along with some bottles of brett saison I did a year ago, one of which was on apricots. If you’re interested in trying these, I’ll let you know when and where in the near future. Soooo, it’s been awhile. Like, a looooong while. That while unintentionally spanned half a year of rearing my grabby-handed little time vampire, a diabetic cat brought back from the brink, and a bouncy Kindergartener bopping her way through her first semester with rainbow colors. Even with limited time for drinking, writing, or the things the make life worth living, I was able to sneak in a few stellar brews (2013 BCBS, Two Claw, Mexican Biscotti Cake Break, and BA Ten Fidy come to mind), a few disappointments (a 2013 Coffee BCBS that aged a year too long and High Water’s BA Campfire Stout) and a blossoming appreciation of bourbon/whiskey as indicated by my shelf of half full (aren’t I the optimist) bottles of William Larue Weller and Westland Garryana (seriously, check it out). While this hiatus saw me betray my first love (you’ll always be number 1 on my tongue beer!) with wood-barreled libations, I also took time to reflect on my new reality. As a father of two, I only have so much endurance for the never-ending parade of ridiculously titled releases from the hundreds of reclaimed barn wood, charcuterie, and aioli infused brewpubs that opened while writing this sentence. I realize that the industry is a ceaseless cult of the new, the carrot on the string with another dangling a little further down the line. Keeping tiny humans alive is exhausting enough without constantly monitoring the Facebook/Instagram/Twitter feeds of every bottle shop within 60 miles for those oh-so-convenient mid-workday limited releases. I’m not going to give up on the chase entirely, but over time I’ve found it less and less satisfying. That’s why I shifted my efforts to better serve my love of beer and status as a parental shut in. For much of 2016, I’ve powered through batch after batch of brewing beer in my very home (homebrew if you will), learning all I can about the science of good beer. I’ve graduated from halfhearted tinkering with 1 gallon extract beers that explode during storage and pasta strainer all-grain batches to yeast starters, counter flow chillers, re-circulation pumps, water profiles and temperature controllers. After a few years of brewing what the least discerning pruno enthusiast would consider undrinkable, I’ve developed a stable of solid beer recipes, including a Brett Saison on apricots, a RIS, a raspberry coffee porter, and a few foggy, hop-forward NE IPAs. I’ve yet to contract the extreme experimentation bug that leads to black lime, curry and avocado stouts, instead trying to perfect beer styles and split them up into adjunct heavy variants. In the new year, my plan is to expand into sours, mess around with some experimental yeasts, barrel age something and possibly step out of the shadows with a few competitive entries. We’ll see. What does this mean going forward? Well, I’ll still cover the occasional beer review for some of the bigger beers I score. I already have a few articles, reviews and other stuff half ready for posting. I may throw in some bourbon/whiskey tasting notes as I work my way through the whiskey tree and acclimate my tongue to its many boozy branches (I’m Drew Hikes on Distilld). I’ll also cover my brewing experimentation and research into any and every topic a brewer and beer drinker needs to know. Maybe even a few more podcasts/blind tastings if I can lure some people into the baby’s den to record. P.S. – If you happen to see me at my favorite haunts (Railroad House Inn in Marietta and Bulls Head Pub in Lititz if you’re wondering), I’ll probably be packing some homebrew and looking for people opinions. It’s win-win, so come drink my beer! 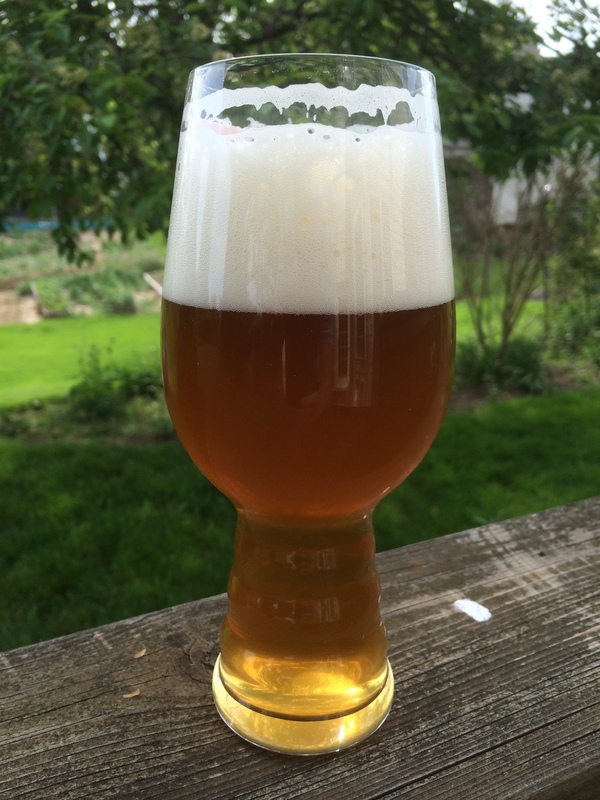 We finally got to try our Pliny the Elder homebrew clone and it was worth the effort! Made with Hikes the elder, my dad, we brewed the actual all-grain recipe provided by Russian River’s Vinnie Cilurzo. If you are wondering about the process, we used loads of Centennial, Simcoe, Columbus, and Cascade hops, even adding some to the mash, and dry-hopped the crap out of it. I’ve had Pliny the Elder several times, twice on draft and once out of a bottle, and I can say that this version closely resembles the draft from what I remember. I’d really need to have both side by side, but this is easily the tastiest brew we’ve done yet. We are gaining confidence and I look forward to experimenting with some original creations. Next up, I think we may try a coriander and herb Wit.